It's such a hot and humid day, I chose to stay in this afternoon and set a table for all who may need a refreshment when they come in out of the heat. 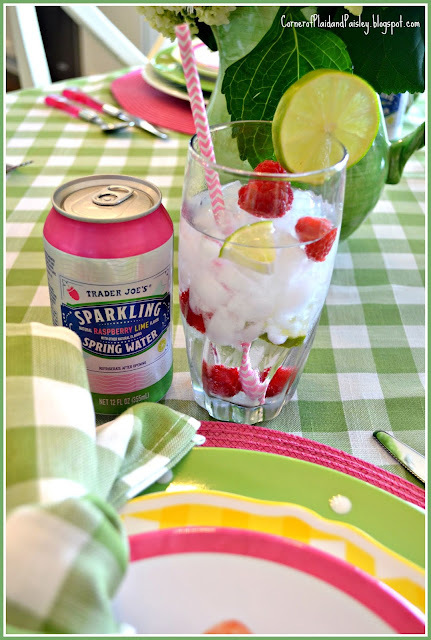 This bright lime green and pink table setting was inspired by cans of sparkling water when I picked up some flowers at Trader Joe's. Just as the plates say - setting this table helped me "chill out" after working outside this morning. 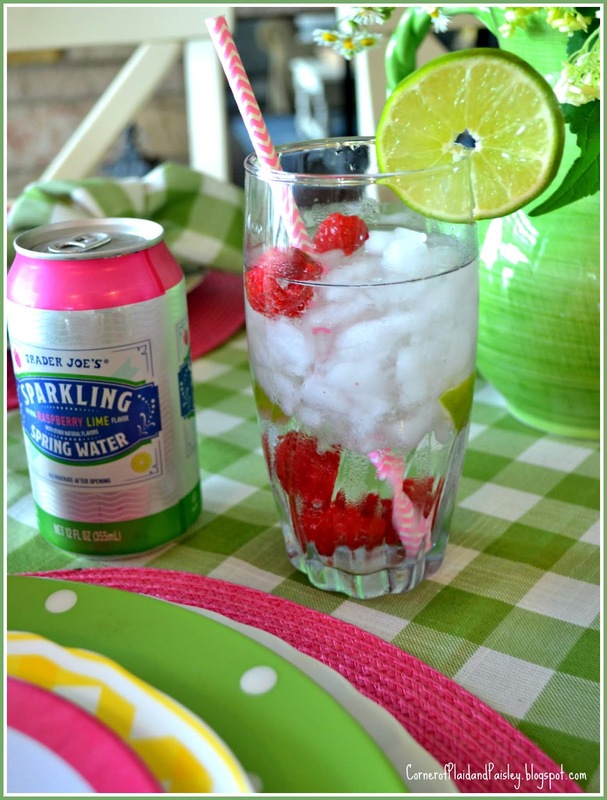 And a wonderful flavored sparkling water will hit the spot. I gave up drinking pop (yes, I am from Ohio!) or soda, as most know it, about a year ago. So flavored waters are a nice treat now and then. I haven't bought any popsicles in a long time!! But I am thinking I may try making some fruit popsicles this week. I hope you find a way to stay cool in this summer heat. Thanks for stopping by and getting a dose of refreshment! Green and White Polka Dot Plates -Signature Dots from 2010 -Elder-Beerman years ago - bummed they are closing! Popsicle plates - Michaels - last week for $1 a piece! Ann, this is such a cheerful table, it will definitely banish the heat! Bright colors say summer fun like nothing else. I love all the details - the straws, the fruit in the drinks, the way you tied the napkins. This is perfect for chilling out in the summer heat! Your dish stack is fantastic - from the polka dots, to the checks, to those popsicle plates! 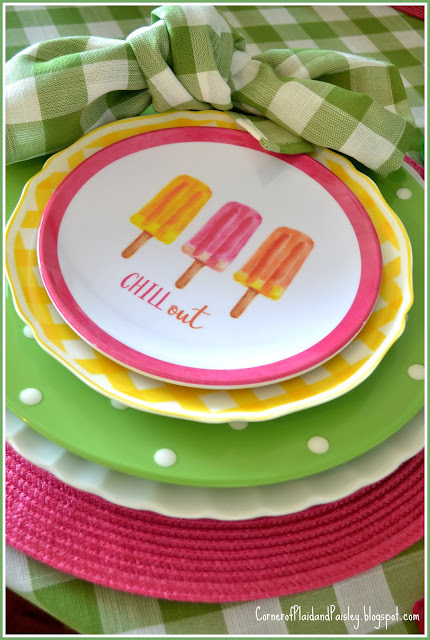 oh goodness I love those popsicle plates! So so cute with the brignt checks and polka dots! 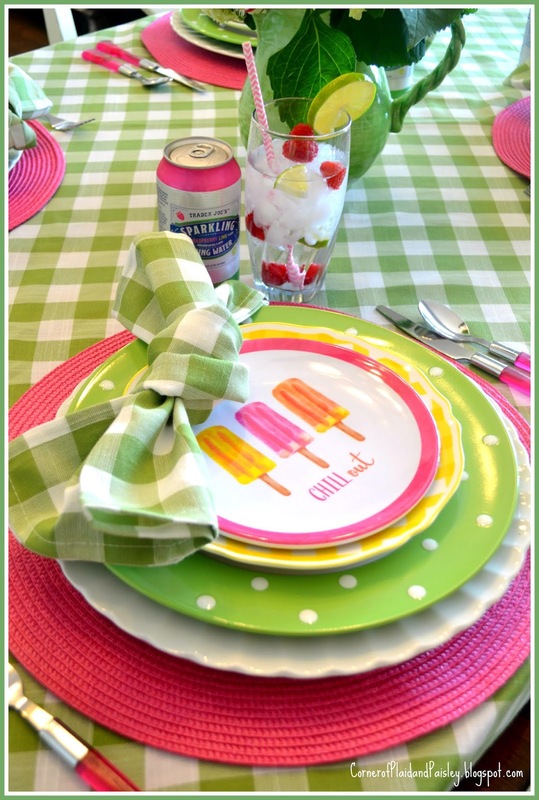 Pink and green is one of my favorite combos, so happy and summery, I just love everything Ann! Love, love, LOVE this setting!!!!!! I featured these same popsicle plates on the show yesterday morning as an example of a fun summertime look! While I've not yet used them in a tablescape, I know I'm going to get some mileage out of them! I couldn't believe my eyes when I saw they were only $1 each!!! I scooped up all they had (6) and hope to find a few more. I absolutely adore how you chose the green and white polka dots and the yellow and white plaid to pair up with them! Those contrasting colors bring out all the juicy goodness of the popsicles! Nailed it, girl! 100% NAILED IT!!!!!!!! Have a great weekend! Love this cool summer table. Where can I find these cute popsicle plates? 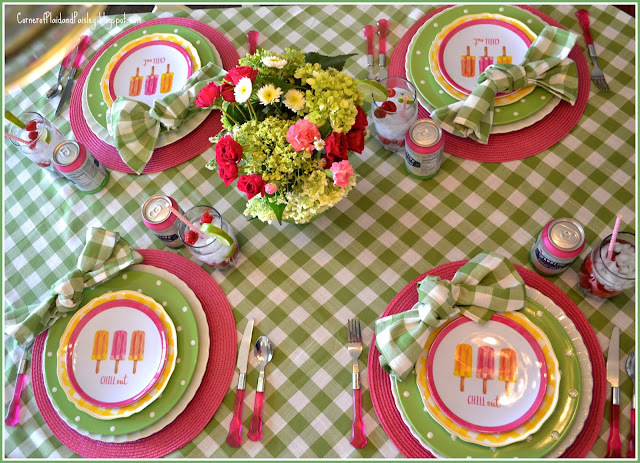 Darlene, The popsicle plates are from Michaels -on sale last week for $1 each - hurry, before they are out of them! 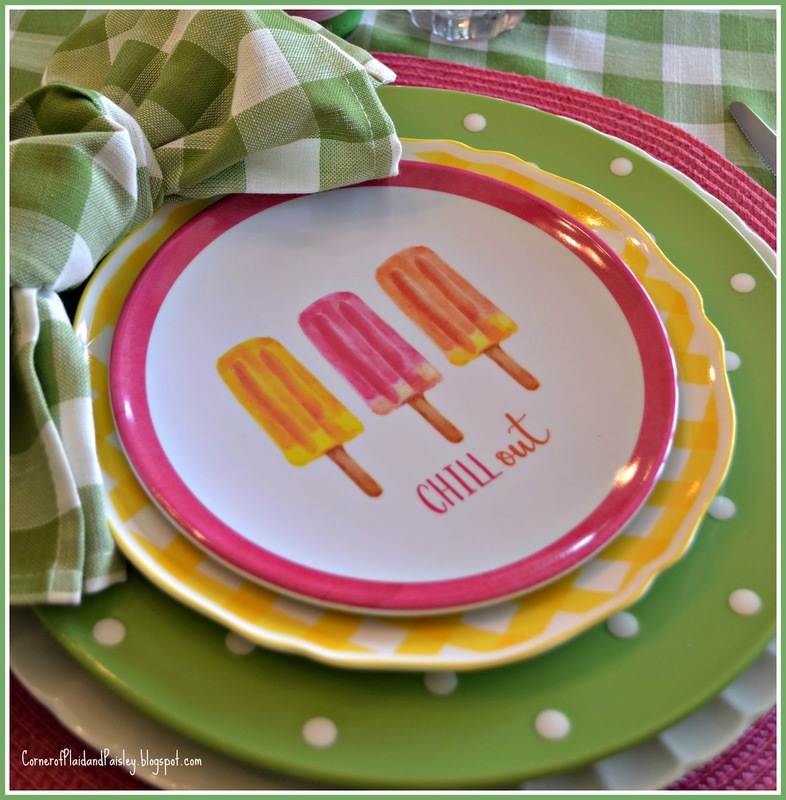 I love the colors of this table, and the popsicle plates are darling! This is so darn cute! I love all of it, but those popsicle plates are too cute. What a refreshing tablescape, and it's so happy! Love the popsicle plates too. Ann, I love this happy table! The popsickle plates are too cute. This just speaks of summer! This is gorgeous! Thanks for sharing it with us at Celebrate Your Story.